State of the Art Laser Dentistry Dr. Aldrich is first in the area to have a Hoya ConBio Erbium:YAG all tissue laser capable of doing, surgery on soft and hard tissues, and many fillings with out an injection. He holds certification from The Academy of Laser Dentistry. Laser Treatment Over Other Forms of Surgery? In most instances lasers remove gum tissue without causing bleeding. The laser seals blood vessels and nerve endings. There may be less pain and swelling postoperatively. Because lasers can control the amount of bleeding, the surgical area is kept relatively dry which improves the dentist's visibility. There is also less risk of spreading blood-borne diseases and less trauma to adjacent teeth and tissues. Lasers used for cavity preparation often reduce or completely eliminate the need for local anesthetic. Will I Still Need Anesthesia? Probably not! In clinical studies 96% of patients required no anesthesia when the VersaWaveTM dental laser was used to remove decay. This means that you will not have to spend time waiting for numbing to take effect or to wear off. Additionally, multiple teeth in different parts of your mouth can be worked on in ONE visit. You may still choose to have anesthesia, while avoiding the sound and vibration of the drill. The aspect of laser surgery that most people appreciate is its comfort. While no treatment is always painless, the laser may reduce the need for postoperative pain medication and may reduce swelling and bleeding. Dr. Aldrich is a member of the Academy of Laser Dentistry and has certification in Erbium laser (2005), Diode laser (2005) and Neodymium laser (1990) lasers wavelengths. Dr. Aldrich received training from The Academy of Laser Dentistry, The College of Clinical Laser Dentistry at the Nash Institute and from The Florida Dental Association. 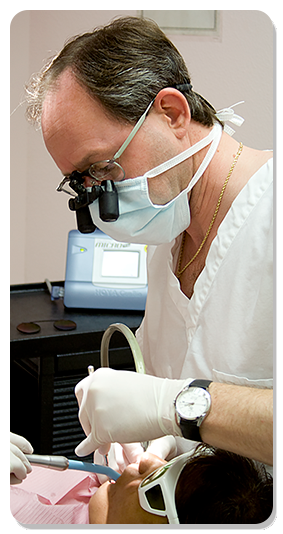 If you have any questions about Laser Dentistry, please feel free to contact us. There are a variety of lasers that can be used to treat periodontal disease. Lasers can be used to remove inflamed tissues within a periodontal pocket. Lasers can be used to trim away diseased gum tissue. Lasers can even remove muscle pulls and benign tumors. Lasers can be used to increase the length of a tooth above the gum line so that crowns can be properly placed. Lasers treatments may be more comfortable than treatment with conventional instruments. Lasers reduce the need for pain medication and may reduce swelling and bleeding. The gum tissue may be removed without bleeding and swelling because the powerful light beam seals blood vessels and nerve endings. Gum disease occurs when bacteria attack the supporting soft tissues and bone around your teeth. These bacteria cause a body reaction which is responsible for the breakdown of the fibers that connect the tooth to the bone and create a space that dentists and hygienists call a periodontal pocket. These pockets are difficult to keep clean and the result is infection leading to the loss of bone. The main cause of gum disease is poor oral hygiene. If left untreated, the supporting bone is destroyed and the teeth may eventually become loose and painful.